Tonight! Psyche Power Hour at 7pm UK, NY & SF, will be Rising Sons at Ash Grove, May 28th 1965, with Ry Cooder and Taj Mahal amongst the young bands ranks! 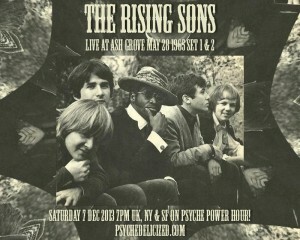 This is both sets played that day in great quality, tune in, sup your bourbon and dig them fledgling psyche blues! Enjoy!